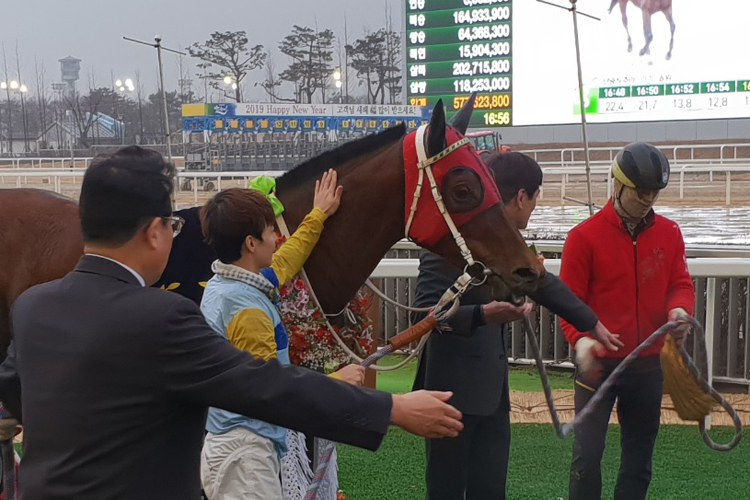 Silver Wolf successfully retained her Donga Ilbo Trophy title on Sunday, overcoming a game Cheongsu Yeogeol in a back and forth stretch duel at a soaking wet Seoul Racecourse. The former Champion Filly/Mare was sent off at a shade worse than even money for the 1 1⁄8 m Listed event that she won a year ago with Gyeongnam Governor’s Cup winner Sky Bay second in the market ahead of the overall 2018 Queens’ Tour winner Cheongsu Yeogeol. All three of the big players were ridden patiently early on over a fast track that one race previously had seen US import Covergirl Justice set a new track record for 6 1⁄2 f. Patience was necessary as the pair of Tour Rose and New Partner set a furious pace that inevitably caught up with them once the line was in sight. That left Moon Se Young on Cheongsu Yeogeol making the first move, but Silver Wolf was right there with here. The pair came together, and battle was joined. Yoo Seung-wan’s mount got in front but Cheongsu Yeogeol pegged her back and even led into the final furlong. Ultimately though, the older mare was too strong and jockey Yoo even had time to celebrate as his mount crossed the line just under a length on top. Silver Wolf was a $40,000 yearling purchase from the 2014 Magic Millions Gold Coast Sale but has now taken her earnings to in excess of US$1.7Million. Arguably the best Australian horse imported into Korean racing ever – at least with racing in its modern format – she’s confirmed her place atop the filly and mare ranks. Last year she followed up her win here by going to Busan and beating Power Blade in the Busan Ilbo Cup. If she is taken on the sprinting route again, a repeat isn’t impossible.